On this day devoted to love, I admit to adoring a man who’s not my husband. Yes, Harold knows. He also thinks highly of the guy, though he’d draw the line at “adore.” Not me. I love what this guy did for humanity. 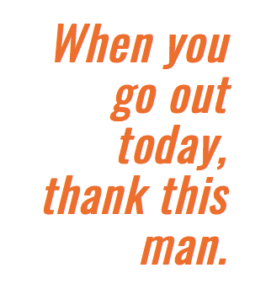 When you go out today — reasonably certain of being able to get where you want to go without incident — thank this man. He had something to do with your safe travels, even though you’ve probably never heard of him. His name is William Phelps Eno. Well over 100 years ago he created pretty much everything we take for granted as we move about on our public roadways. Stop signs, crosswalks, traffic circles, one-way streets, drivers’ licenses: That’s all from Eno, and much more. Perhaps the biggest thing he did was develop the “Rules of Movement” that we still use today. At least most of us. Yes, there are people on bicycles who don’t use them — and more terrifying, people in cars. I’ll get to that in a minute. Eno didn’t invent the Rules of Movement. He observed the way ships operate on the high seas, and applied these ideas to our public roads. are BY FAR our largest public property. We’ve used them for centuries not just for travel, but for socializing, commerce and play. Lately we’ve been using our public property to make statements. #InsertYourCause and go march on a large arterial road. 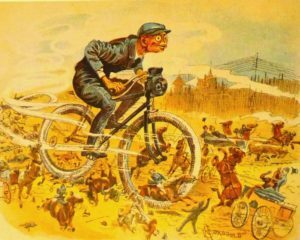 Things got worse before they got better, in part because of nifty new machines that everyone was riding. 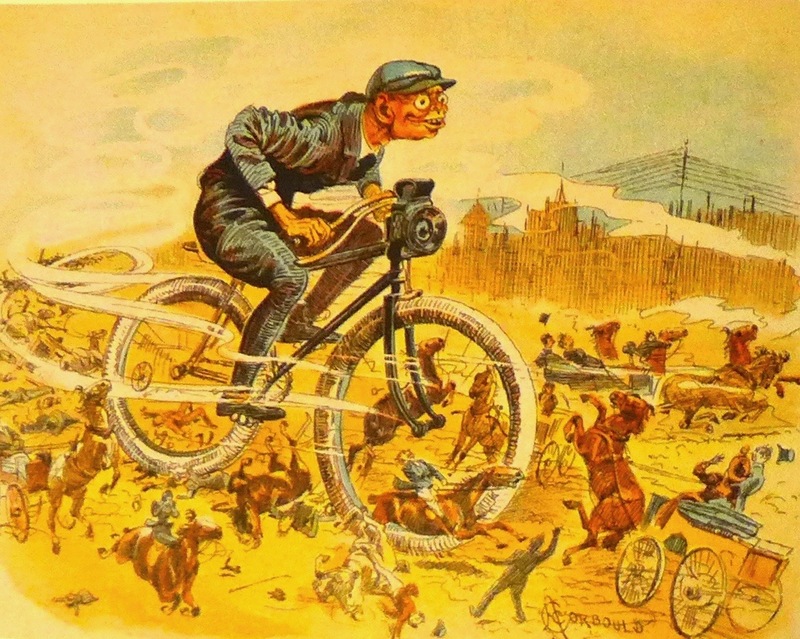 Hooray for bicycles! At the turn of the 20th Century, “scorchers” were accused of scaring horses and causing crashes. Many victims were children playing in the street, which led to a public outcry. Somebody had to do something! At age 40 he left his family business to work on road safety and traffic control. His innovations led to the elegance and simplicity that define the US transportation system, and others around the world modeled upon it. People on bicycles fit right in. It took me awhile to truly understand and embrace this. I learned the basics when I first took CyclingSavvy. What? 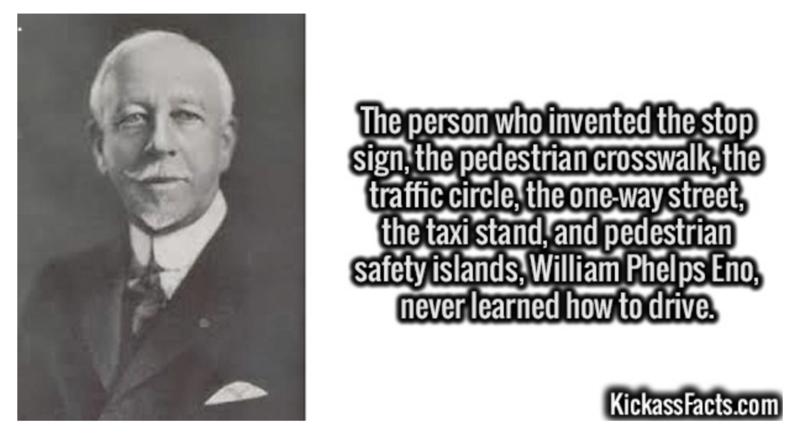 The guy who created rules for safe traffic flow and designed the world’s first traffic plans and is honored as the Father of Traffic Safety never drove a car? Eno died in 1945, so he could have driven one. 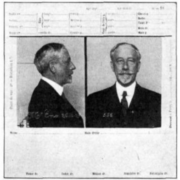 He’s said to have detested cars, and predicted they’d be a passing fad. Well! This was inspiring. I loved learning that the rules regarding traffic were developed well before the rise of the automobile. But look what’s happened since then. We’ve watched Eno’s ideas scale “up” to the point where private auto use has become ubiquitous. These days, cars are overused to the point of ridiculousness. One of every four auto trips in America is less than a mile. That’s heartbreaking. Our challenge now is showing how Eno’s ideas scale “down.” Hell, yes, you can use your bike instead of your car! Your safety is a product of your behavior. When crashes happen, we can almost always identify the behavior that led to the crash. That’s a big part of what we do in CyclingSavvy: We show people what really causes crashes, and more important, how to avoid them. I wish Eno were here. I’d take him on a bike ride. He’d instantly understand how savvy cycling — created by two other people nobody’s ever heard of — could make the use of cars…not a thing of the past — they’re just too useful — but much less necessary. I will be forever grateful to Eno for teaching me that the Rules of Movement — which he so brilliantly applied to our public roads — have nothing to do with size or speed. They have a whole lot to do with another “S” word, as well as a couple of “C” words. No, one of those “C” words is not cars! Safety, courtesy and cooperation are the hallmarks of the US transportation system. While the rare bad encounter sticks in your craw, think about how good and uneventful your typical commute is, however you convey yourself. For this you can thank Eno.